FORT MYERS, Fla. – Lee Association of Remarkable Citizens member Joe Raby might be 76-years-old, but is still ready to learn something new. It’s a Thursday morning as he prepares for a circle drum lesson with about a dozen other people. Raby, who has intellectual disabilities, has been coming to LARC for 65 years — as long as the non-profit has existed. “There’s no other place he’d rather be ever in 65 years,” Anne Gaddis, Raby’s sister, said. No place Raby would rather be because 65 years there was no place else for him to go. LARC formed at a time when his parents were told their son couldn’t go to school because he was labeled a disruption in class. Over the years, Raby learned skills through LARC and worked real paying jobs. 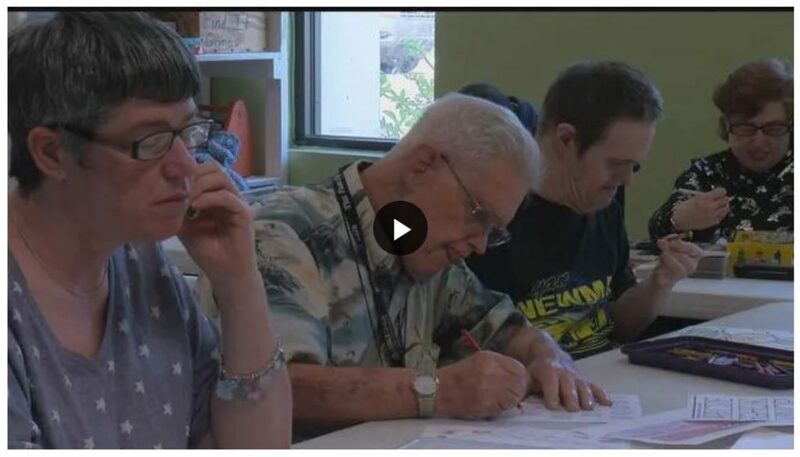 “[The people who come here] might be different on the outside, but when you really get to know them inside, [they are] just these beautiful people who share themselves in a different way,” Angela Katz, LARC’s development director, said. The focus for LARC now is on the next generation of “Joe’s” and teaching them skills in tech and innovation for the future.